PayrollPanda — How to integrate QuickBooks with PayrollPanda? Help Center Home App How to integrate QuickBooks with PayrollPanda? PayrollPanda integrates with online accounting software QuickBooks, it will auto-sync the payroll data into your QuickBooks account. Follow these straightforward steps to setup the integration. Here you can choose if you want to auto-sync or manual sync the payroll data into your QuickBooks account. If it’s automatic it will be updated as soon as you process payroll, if manual you have to sync to QuickBooks once you processed the payroll under Payroll History > Sync with QuickBooks. The journal entry date will be either the payroll date or a custom calendar date. In order to sync, you need to map the payroll data to the QuickBooks Charts of Accounts. On the left side you see each of the PayrollPanda items, while on the right side you can select each of the QuickBooks items. Under Payment Recipient you find the accounts that track what the company owes to the employees and statutory bodies. Payment Recipient is mapped with Other current liabilities. Here we map each of the Payroll Items against the Employer Portion and the Employee Portion. The Employer Portion tracks the expenses the company incurs with the statutory bodies. The Employee Portion tracks the expenses that the company incurs with its employees. It's mapped in QuickBooks to Expenses > Payroll expenses. Note: All additions or deductions occurring in Payroll must be mapped as well to Expenses > Payroll expenses. Salary Gross is mapped against Staff Salary. 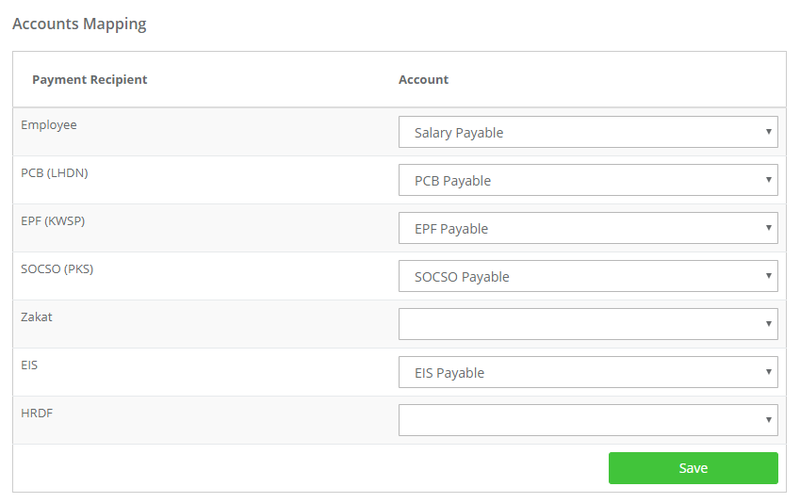 Note: The account mapping for "Salary (Gross)" should not be mapped against the same account used in the "Payment Recipient" section, instead it should be mapped against some other expense account such as "Employee Salary", "Payroll Expense", etc. PCB (Borne by employer), Employer EPF and Employer SOCSO are mapped against PCB Expenses, EPF Expenses and SOCSO Expenses. Note: Employer Portion should not be mapped against the same account used in the "Payment Recipient" section. PCB, Employee EPF and Employee SOCSO are mapped against Salary Payable, PCB Payable, EPF Payable and SOCSO Payable. 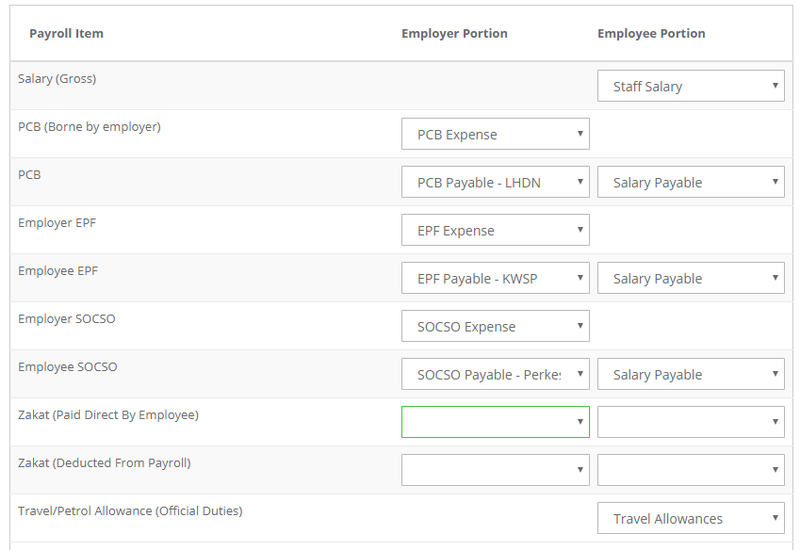 Note: Here, Employee Portion should be mapped against the same account used in the "Payment Recipient" section for "Employee" as the amount will be deducted from that. The employer portion should also be mapped against the same account used in the Payment Recipient table. Travel/Petrol allowances > mapped in QB to expenses > Payroll expenses. If you need any further assistance with the setup you may reach out to us via the in-app chat.